You’ve been searching for a place to store your vehicle, but also a few extras. Maybe you even found a few options that you like. But, how do you know the right size garage to choose? The following should help you decide on the right size and introduce you to a few other features to consider as you complete your search. Most of our garage customers store lawn tractors, zero-turn mowers, ATVs, motorcycles, boats, etc. They are looking for the convenience of the garage style overhead door. We also see other customers purchasing a garage to store their cars, SUVs and pickup trucks. All our garages feature a 9 foot wide opening. The door opens to 6’6” tall. This opening will allow access for most vehicles. Unless you live in a hurricane prone area where construction codes limit garage doors to 8’ x 6’6” openings. 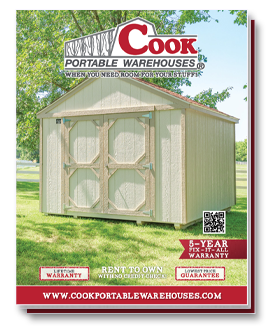 Customers should check with their local Cook Portable Warehouses dealer to verify the width available in their area. NOTE: if you’ve added any aftermarket accessories they may exceed the 6’6” height. Customers with these types of vehicles will want to measure the full height of their vehicle to ensure sufficient clearance. *If you want a workshop and vehicle storage both, the best practice is to add 10’ to the length of your vehicle. An average car is around 14’ long so the 12’ x 24’ may work. 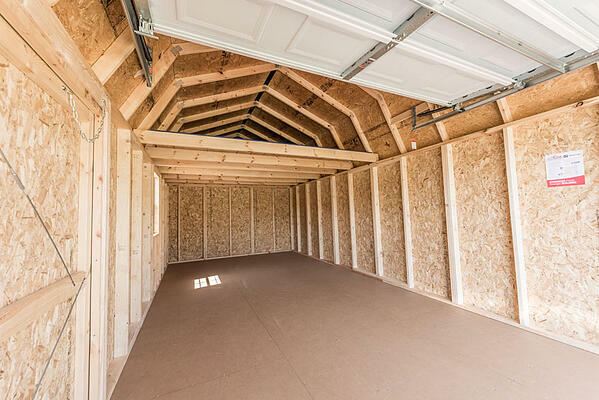 But, if you have a full-size pickup truck or SUV you may need the 12’ x 32’ garage. 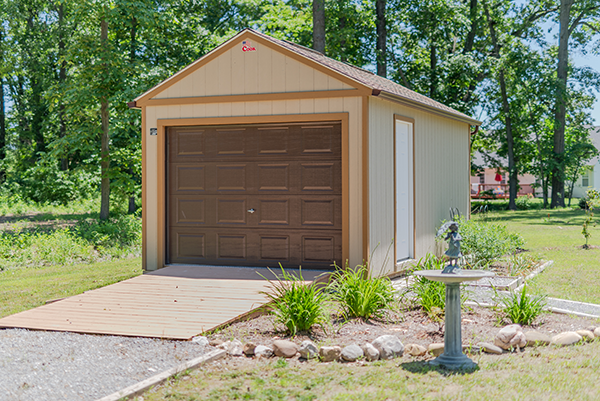 Each of our garage style options already include a heavy duty floor system. This has ¾” floor decking and floor joist 12” on the center. It’s designed to support any standard weight vehicle. Full-size pickup trucks or SUVs typically weigh 5,000+ lbs and will be supported. Do you really want the loft space? This does not have any impact at all unless your vehicle height is more than 6’3” tall. You can add the loft to the Utility Shed or purchase the Lofted Garage where it is already built into the price. Modify the design. With Cook we have custom options to choose from to make your garage unique to you. You can change door placement, add extra windows, flower boxes, shutters, etc. Plus, you have control over the color of your shingles and your siding. See your color options below. NOTE: due to varying computer screen resolutions and settings, the color you see on your screen may not be accurate. Please see your local dealer for shingle and siding samples that will display the true color and texture. Add a ramp. Our garages do not come with a ramp because of the varying terrain at each customers’ location. We recommend customers look into different options after the garage is delivered. Then you can decide what you need based on your needs and landscape preferences. You may like a wood ramp, pre-fab metal ramp or a poured concrete ramp. Add a driveway to the garage door or a sidewalk to the side door. Think about access to your building. What’s the best way, on a rainy day, to still allow you easy access? Landscape around the garage entrance. Add plants, a welcome sign, a bench or swing to the side. Create a welcoming environment for you to drive up to every night. If you think one of the garage styles might work for you, visit your local dealer or start building your garage below!